It’s no secret that I fell in love with the concept of eating locally grown food after reading Barbara Kingsolver’s book- Animal, Vegetable, Miracle. 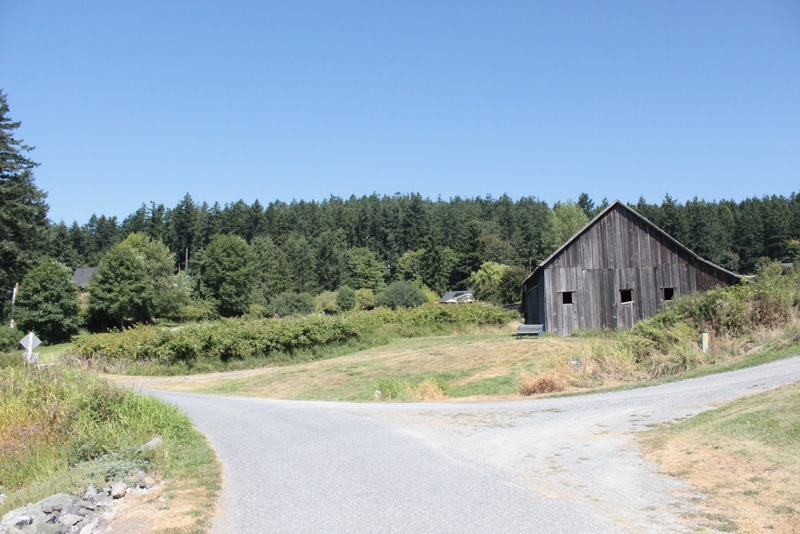 In it she details her family’s journey eating like locavores for a year by shopping at farmer’s markets, growing their own produce, preserving summer produce, raising chickens for eggs and meat, raising turkeys, finding local grainery mills, local wine…etc. The book was eye opening, and I’ve enjoyed re-reading it nearly every year for renewed inspiration. I try to cook seasonally and locally as much as possible and get excited when a meal I prepare is nearly 100% local. 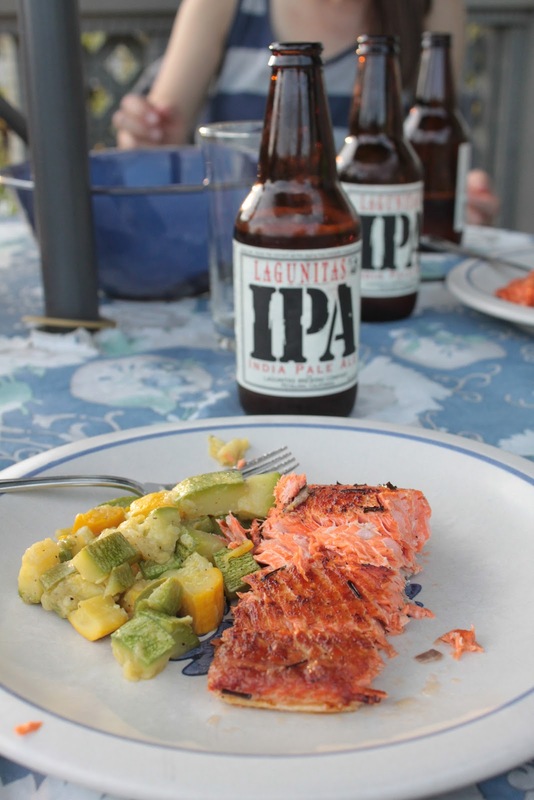 I didn’t expect to do much cooking on Orcas island, much less enjoy a very local meal there. When we arrived at the guest house we were renting, though, I realized that this was really truly a guest house complete with kitchen, dining table and even a table and chairs on the patio (incredible view included). Trevor and I decided we needed to take advantage. The woman we rented the guest house from was incredibly sweet. She pointed out some places nearby that we might like to check out- like the seafood farm less than 500 meters up the road (basically through her backyard). 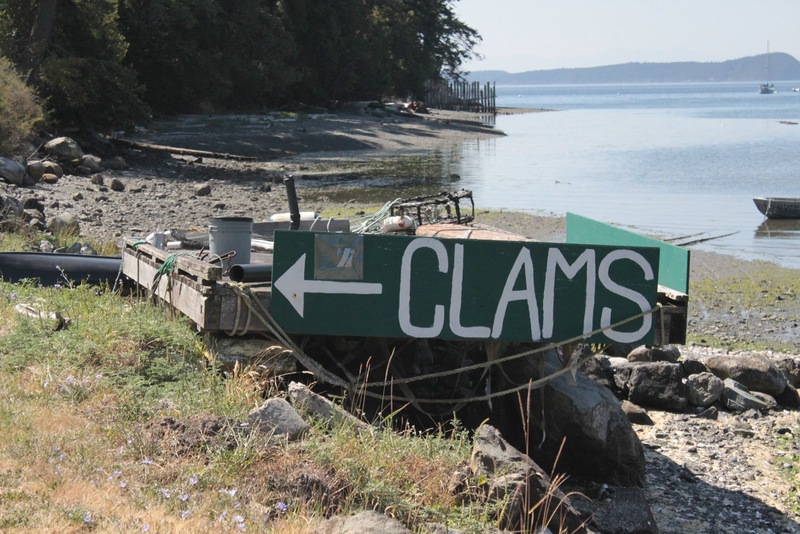 She told us that they had clams, crab, oysters, salmon…oh my! She also said we were free to pick fruit from her plum trees and told us about blackberry bushes just down the road from her house. I was thrilled! Our dinner ingredients would come from less than a 1 mile radius from where we were staying. After getting settled in, we decided to take the quick walk to the farm to check things out. Note the beautiful views along the walk. See those bushes to the left of the barn? Those are blackberry bushes. Nose of the boat, pointing us in the right direction. When we arrived at Buck Bay Shellfish Farm, we asked some questions, found out that they farmed the shellfish and had fresh caught salmon. They also had some zucchini, berries and fresh eggs for sale, because this isn’t just a shellfish farm. There’s actually quite a large area for growing produce plus a big coop with about 30 chickens. They were so friendly and we asked if we could go visit their chickens. We’re a little obsessed right now with less than 2 months until we acquire feathered friends of our own. Little man enjoyed looking at the chickens, and then we left, telling them that we’d surely be back before the weekend was over. We confirmed with our friends, who were also attending the wedding, that they were available to come for dinner on Sunday night. 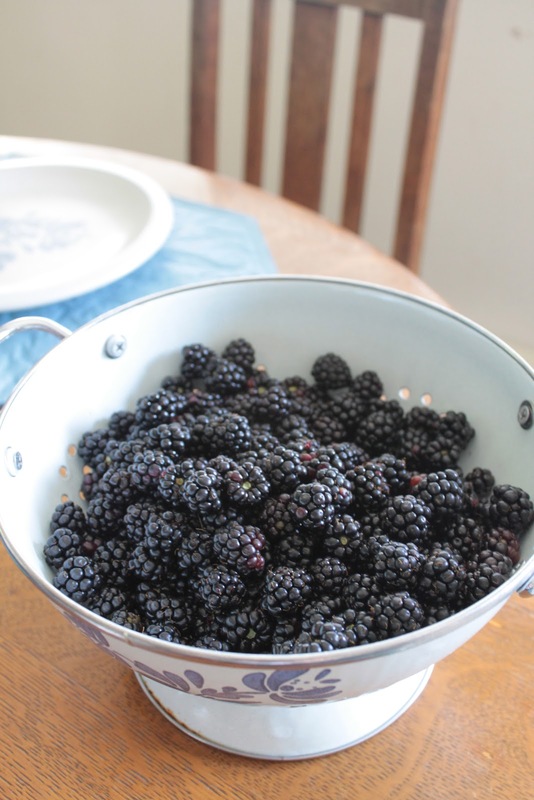 So Sunday morning, we went blackberry picking to get enough fruit for a crumble. Little man absolutely loved it and probably ate half the berries we picked. We could barely keep up with all of his requests for “more” (signing, not asking with words quite yet), as soon as he had shoved a blackberry in his mouth. Me: Oh I only have X amount of money. Can I get 2 lbs of salmon instead of 3? BBSF employee: Oh it’s okay, I’ll just write you an IOU. Me: (kind of in shock) Wow, umm, that’s really nice but we’re leaving really early tomorrow morning and wont have time to get to an ATM and bring you the cash before we go. BBSF employee: You can just send us a check when you get home. Me: (more shock) Are you sure? I mean, that’s so kind, but really? BBSF employee: Yea, we do it all the time. We’ve never had a problem. Me: Okay then. Thank you! Here is the money I do have. BBSF employee: You can just keep the cash and I’ll write you an IOU for the full amount. Me: (flabbergasted) You’re really sure about this? BBSF employee: Yup, everyone has always sent the money they owe us. It’s really no problem. Wow…can you believe such a thing? 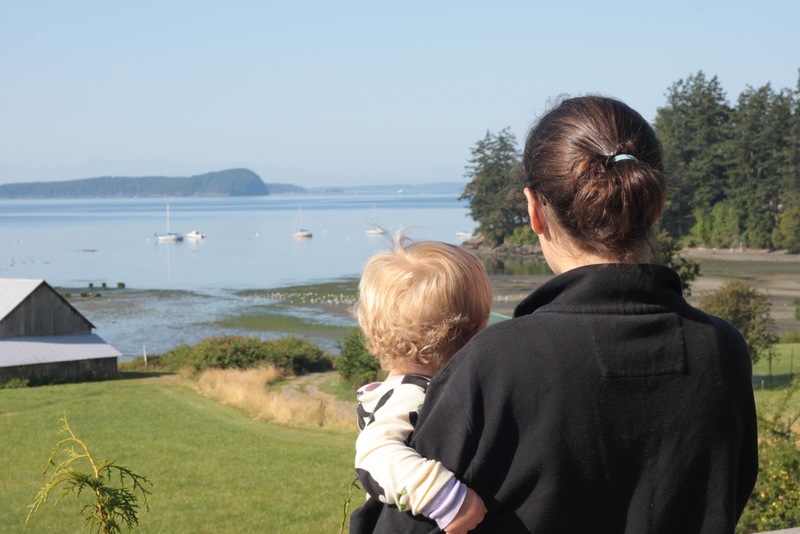 We had heard rumors that Orcas Island was a very friendly place, but now it was confirmed. It was later confirmed a third time, when our host offered up anything in her kitchen we might need to make dinner (while she was not going to be home). I’m telling you- friendly friendly people on Orcas! 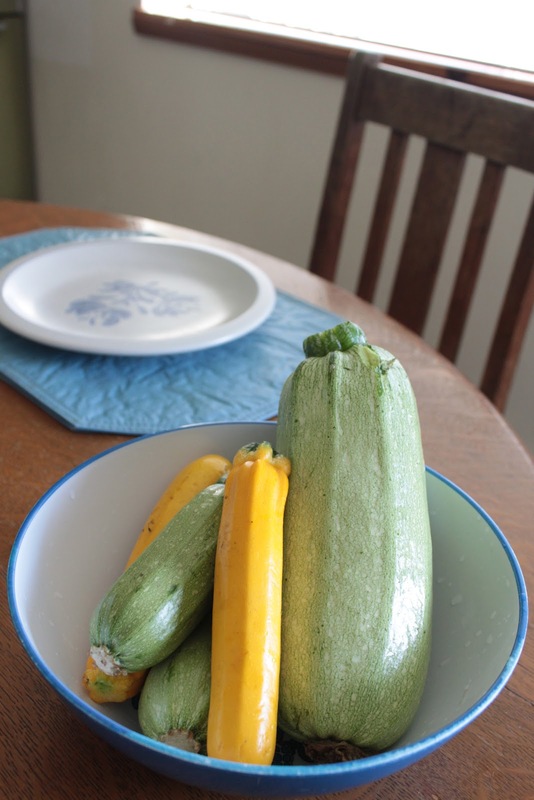 Exhibit 1: Zucchini from Buck Bay Shellfish farm. Less than a mile away. Exhibit 2: Blackberries picked on the way to BBSF (i.e. even closer). I went with a simple preparation. 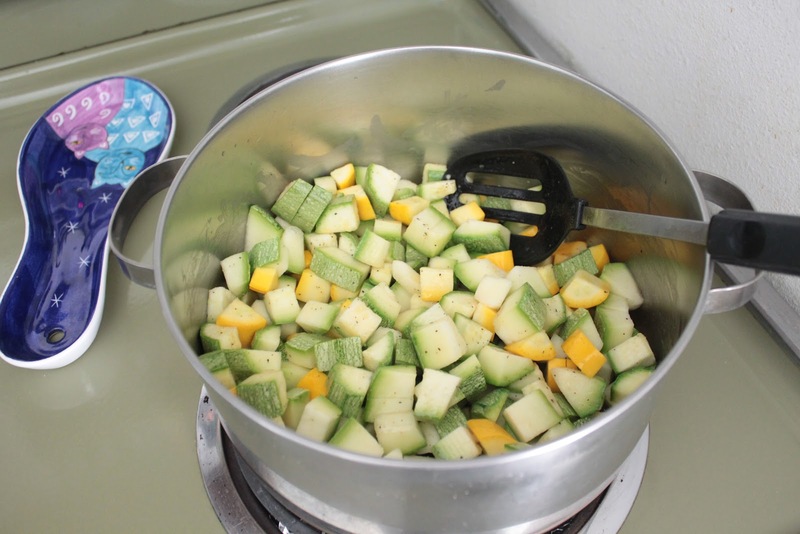 Cubed up the zucchini, cooked it in butter with salt and pepper. Fresh ingredients don’t need much to be delicious. The beginnings of a crumble. I added some plums, also picked on the way to BBSF. A little sugar to counter the tartness of the fruit. I probably could have added a bit more, but oh well. A very local meal with a not so local beer. But at least it’s local to us, so we’re supporting our local economy. The salmon, I put on a sheet of foil brushed with butter, removed bones, brushed the salmon with butter, added salt, pepper, chives (from host’s garden) and the juice of a lemon. Then a broiled it for about 12 minutes. Again, fresh ingredients speak for themselves. It was delicious if I do say so myself. 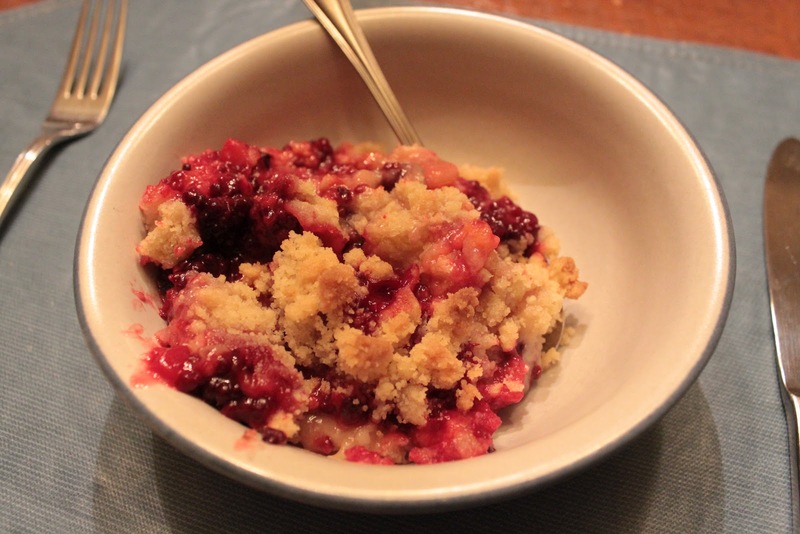 Blackberry and plum crumble. Even the flour was local. We found it (along with the sugar) in the bulk bin of a natural food store on the island, which was perfect since we didn’t need much. The butter, I’m not sure about, but it did say “homemade” and the sugar is almost surely not local. So 6 ingredients out of 9 were local – 5 of which came from less than a mile away. In case you’re curious how I make my crumble topping, it’s approximately equal parts butter, sugar and flour. Mix with your hands until you get a crumble texture. 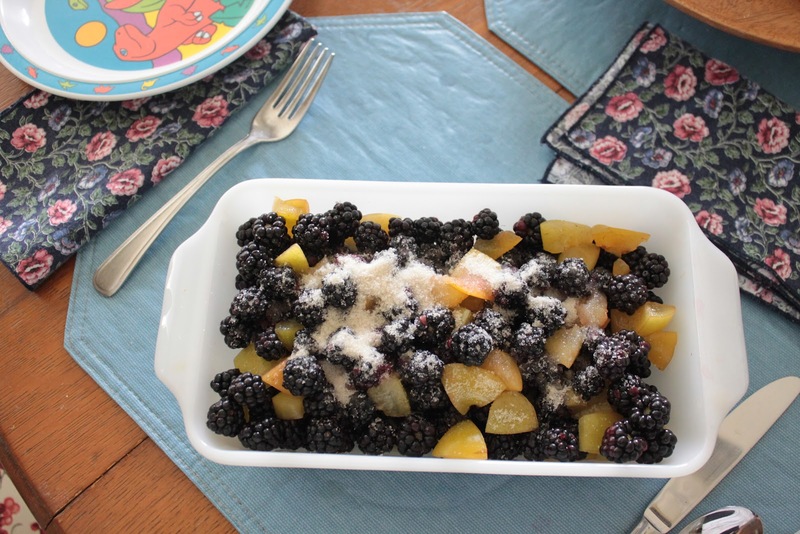 Top fruit with crumble and bake at 375 for about 40 minutes. 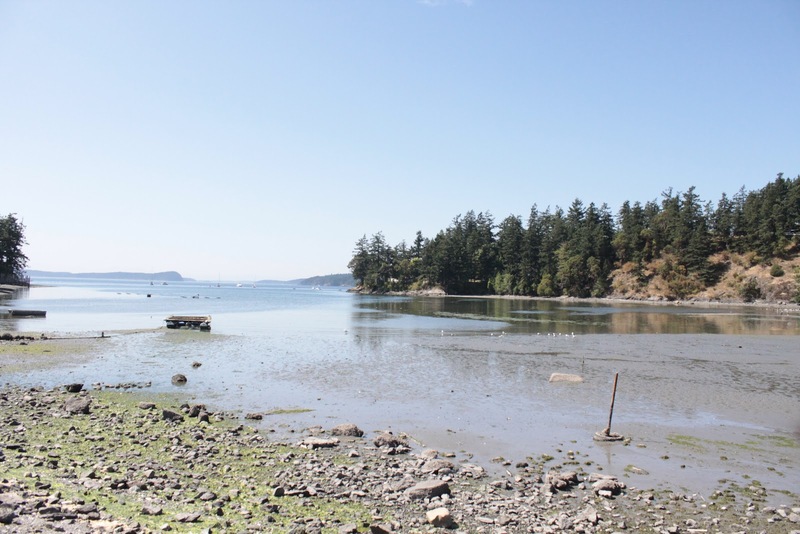 So that’s my epic tale of locavoring it up on Orcas Island. Thank you to all the friendly people on the island who made it such a memorable trip. We will definitely be back! 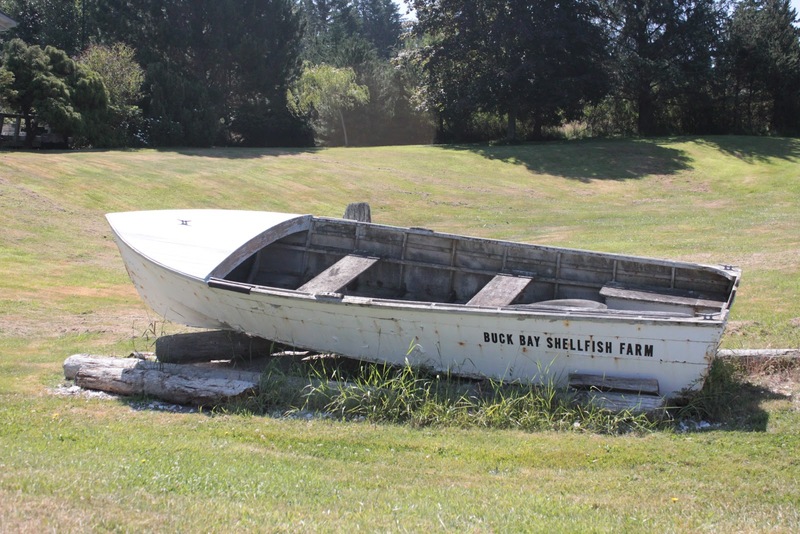 And if you go, be sure to visit Buck Bay Shellfish Farm. The salmon was AMAZING and next time we’ll surely be trying some crab, clams and oysters. This entry was posted in local, recipe, seafood, seasonal, travel on August 20, 2012 by seedsowingmama. If you’re a regular follower of seed sowing mama, you may have noticed that I’ve been fairly absent recently. Out of the last 3 weeks, we’ve been traveling for 2 of them. First, we went to Montana for a family reunion and less than a week later we left for Seattle/Orcas island to celebrate the wedding of some very dear friends of ours. I tried to make sure I had some pre-written posts ready to go before we left but ended up with only a few. Needless to say, it’s been slow around here. Hopefully things will pick up on the blogging front now that we’re back! 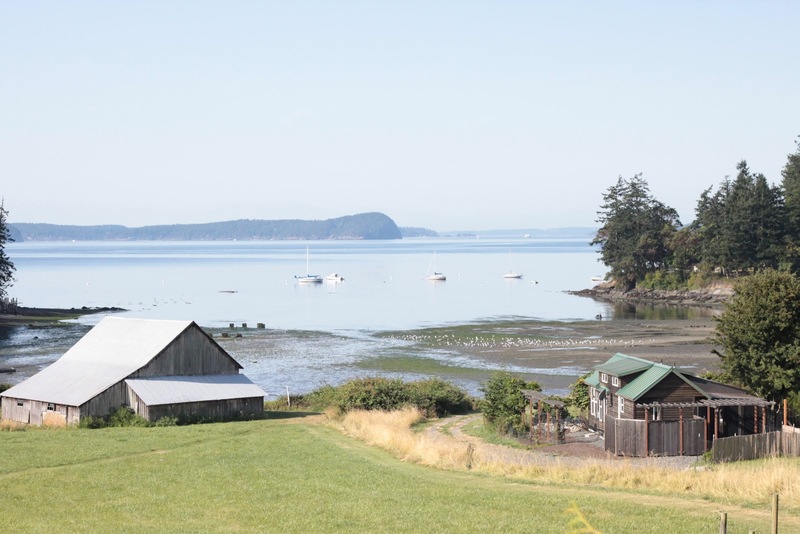 I’m working on a post about a marvelous and VERY local dinner we enjoyed on Orcas island. But until that’s ready, here are a few pictures taken from the patio of the guest house where we stayed on the island. We can’t wait to go back. Orcas was a beautiful and magical place. Thank you to our dear friends for introducing it to us and congratulations on your marriage!! This entry was posted in photo, travel on August 16, 2012 by seedsowingmama.